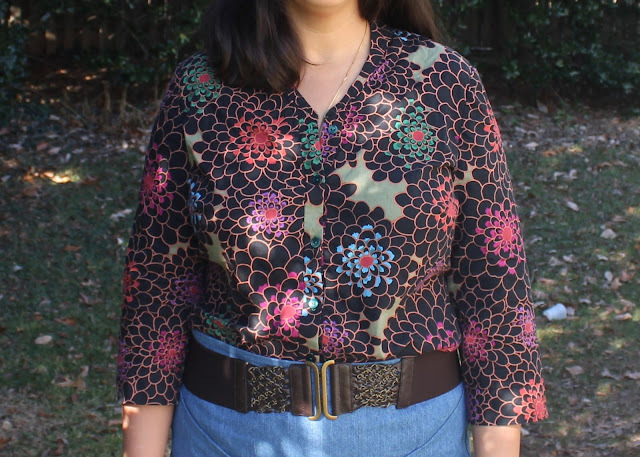 I sewed this top early this fall, took some photos and wrote a blog post draft. Then I wore it twice, decided I hated it, balled it up and threw it into my closet. 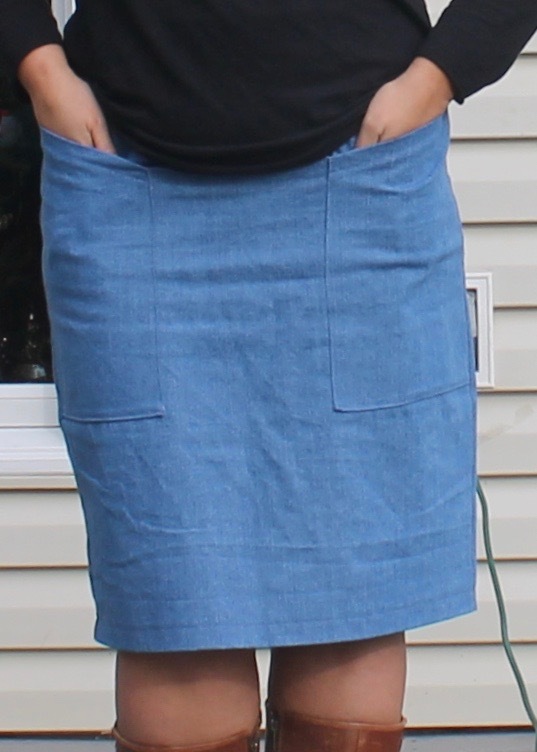 Today I came upon it again while searching for something to wear with my new Alberta Street Skirt. The sun was out, so I took a few new photos. I wore it all day and got several compliments. My outlook on the blouse completely changed, I figured it was time I slap it up on the blog. This is a modified Lisette Traveler. I made three of them in 2014 but none of those fit me anymore. So I had to refit the pattern from scratch. What you see here is the result of many hours of work. I made a number of flat pattern adjustments as I was redrafting the pattern. 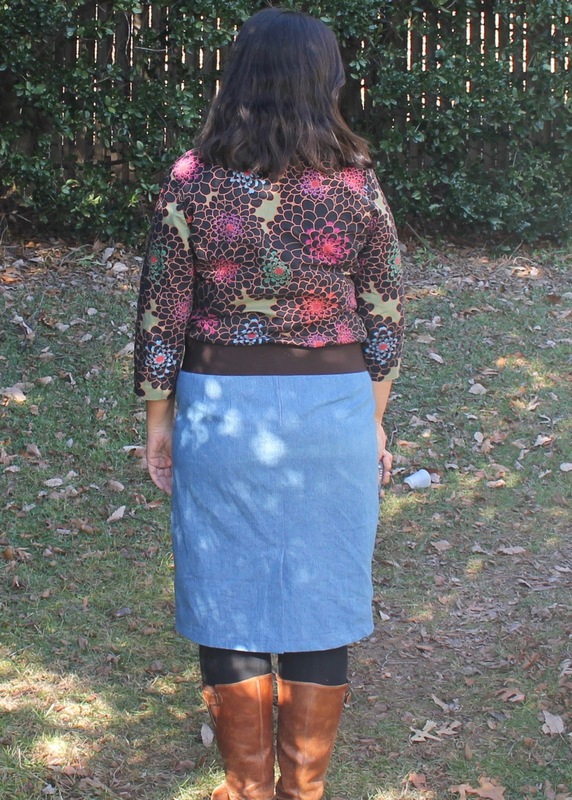 I shortened the pattern, leaving a longer shirt-tail on the back, which I really like. I cut a size 14 shoulder with a large FBA. I can't remember how much but my darts are huge. (If I make this again I should probably split them and rotate one someplace else.) I also moved the dart so that it pointed upwards - I hate horizontal darts. Then I graded out to a 20 at the hip. I drafted in the size 22 armscye as I was planning to use the 22 sleeve - as it turns out, I had to take in the sleeve seams 1/2" each so I think I can go down to a 20. 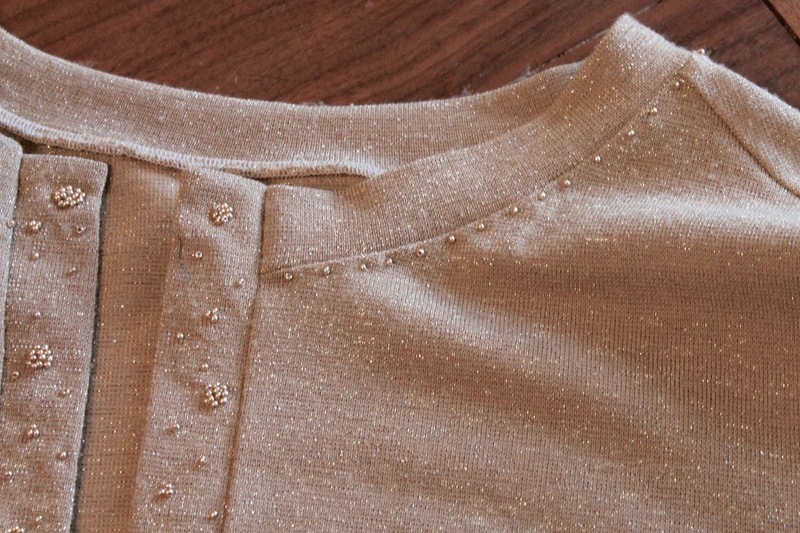 I also did a forward shoulder adjustment - or so I thought - and adjusted the sleeve to match using this tutorial. And this was all before I even cut into my muslin. I sewed up the muslin and one sleeve, and noted that I needed a bit more room in the hips. 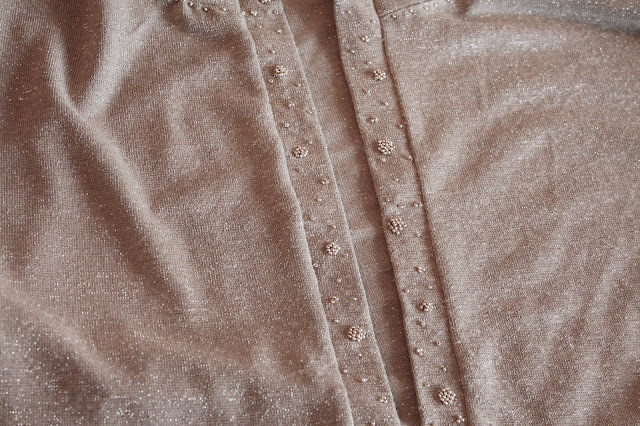 I also decided that I would like to alter the neckline a bit. I really have no idea what I did, and will not be able to replicate it, as I didn't make any notes, so I'll just show you a close-up. It's kind of a v-neck mandarin collar, if there exists such a thing. Then, rather than making a second quick-and-dirty muslin, I decided to do a "wearable" muslin using that thrifted Kaffe Fasset quilting cotton I previously used for my Tulip dress. In my first draft of this post, I wrote, "this cotton really is much lighter and drapier than other quilting cottons I've used; and has more of a poplin shirting-esque hand." After several wears, I need to come clean and tell you that that is simply not true. It's a nice quilting cotton, but it's still a quilting cotton, lacking the subtle drape that is necessary, in my opinion, to achieve a well-fitting button-down shirt. 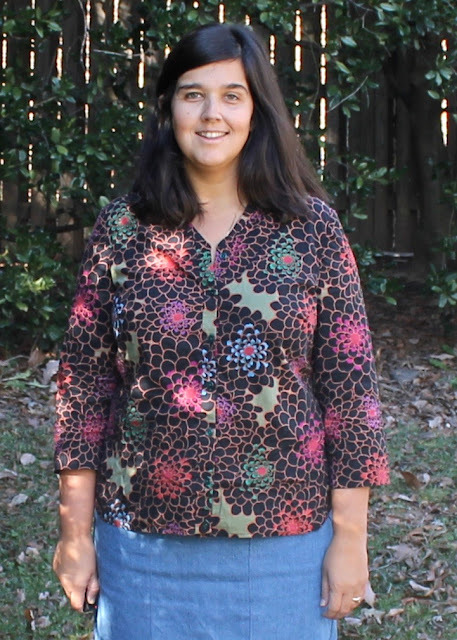 I cut out the shirt, taking care not to position any blooms at my bust points, but other than that not paying much attention to pattern placement. When I went to set in the sleeves I had major problems with too much ease in the back of the sleeve. I had adjusted the sleeve heads forward, but I think I forgot to adjust the actual shoulders of my pattern. I redistributed the sleeve cap around the armscye, effectively undoing the sleeve adjustment, and they went in fine. I also put in two fish-eye darts after I sewed the shirt together; just pinching out until I figured out how wide to make them. Now that I'm wearing the shirt, I see that I really do need that forward-shoulder adjustment. This is another reason that the shirt ended up in the corner of my closet - I hate having to shrug my clothes back throughout the day. Though today I wore it tucked into a skirt, and I didn't have to shrug it back nearly as often. 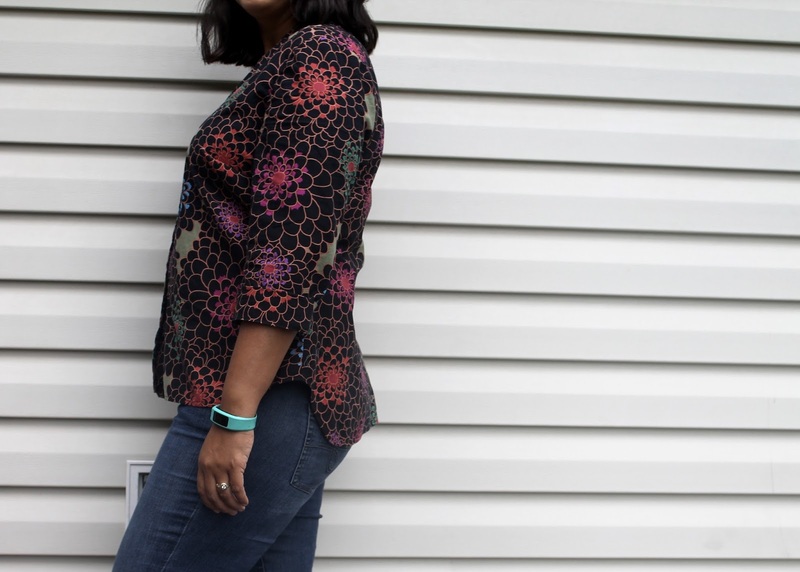 Now that I have paired the two garments, I will probably wear the shirt - as part of this outfit - more regularly. 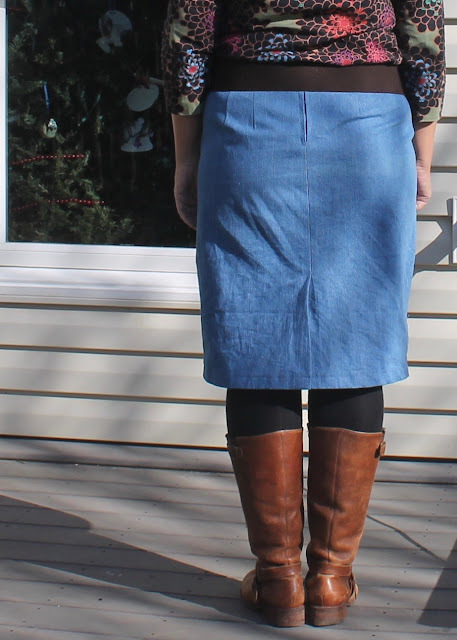 The skirt is Sew House Seven's Alberta Street Skirt. I've had my eye on this pattern for quite some time, and then I won it in a giveaway. This thrifted denim version is my first. The fabric isn't showing up very accurately in the photos - it is a relatively uniform medium-blue denim. As dictated by my measurements, I sewed a straight size 16. I initially sewed the side seams with 3/8" seam allowances because I was skeptical about the negative ease for a non-stretch fabric. But the skirt was definitely too big. So I resewed from the hem to the mid-hip with the prescribed 5/8" allowance. I left the smaller allowances in the upper hip and waistband. When I am standing, the waist seems a little loose. But when I sit down, my fluff shifts and fills everything out. If the waist were tighter, I think it would be uncomfortable to sit in. Or maybe it would just ride up. Either way, I hate that. The pattern went together quickly and easily. My only head-scratching moment was when I was instructed to backstitch the darts at their points; this runs counter to the hand-finishing instructions i have encountered on every other pattern involving darts that I've ever sewn. I ended up backstitching as instructed because I thought maybe that would be a sturdier dart finish on my heavy denim. There isn't any bubbling that I can see, so I guess it's ok. Also, I love the double darts. The pockets are what drew me to the pattern in the first place, only I thought they were interesting seam lines. As pockets, they're not super-useful because the skirt is so fitted. They're nice and big but anything you put in them is visible against your leg. I didn't think to reinforce the diagonal openings of the pockets, but I think it is advisable so that they don't stretch out of shape with wear. It's a great pattern, and this denim version has brought my wardrobe back to life as it goes with just about everything! I've already sewn a second one which I will wear for Christmas (Orthodox Christmas isn't until next week so we haven't celebrated yet!). Look for a blog post on that one soon. 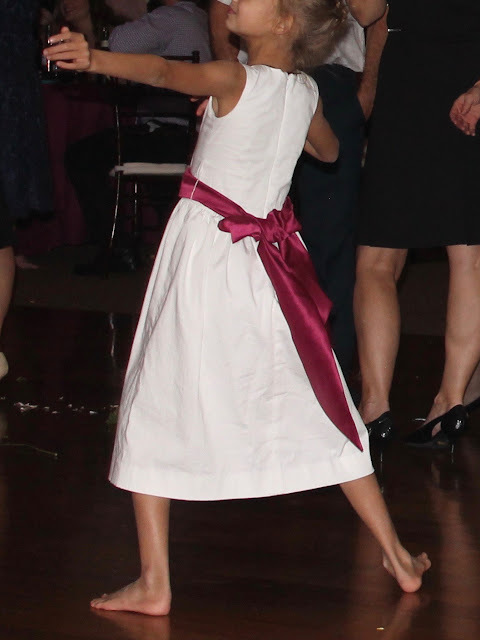 I had originally planned to sew myself a dress to wear to my brother's wedding. I even bought the Appleton dress pattern and some fabric to sew it up. As time drew near, however, I made the uncharacteristic decision to save myself stress and not try to do all the things, and went shopping instead. I got really lucky and found a beautifully fitting princess seamed lace fit-and-flare dress at, of all places, Dress Barn. I find the name of the store really off-putting, but I had received a coupon in the mail and there's one near my house, so off I went. Dress sorted, the only thing remaining was to decide what to wear over it. I had a number of appropriate shawls, but one day I found myself with a couple free hours, so I sewed up my fifth Lisbon cardigan in a metallic knit from the stash. 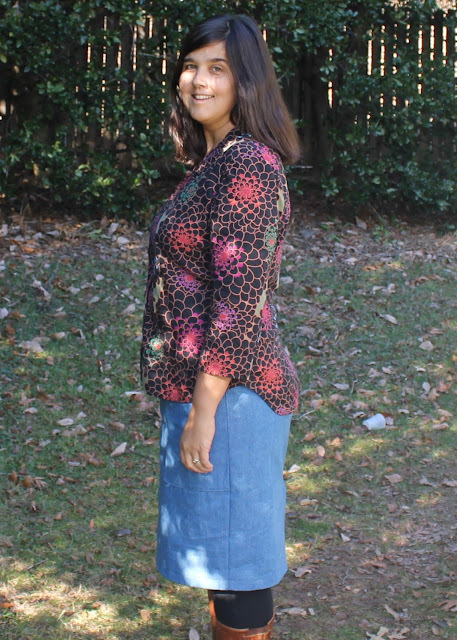 I sewed the cropped variation with a few mods. For this one, I went down to a 10 shoulder and graded to a 12 bust. 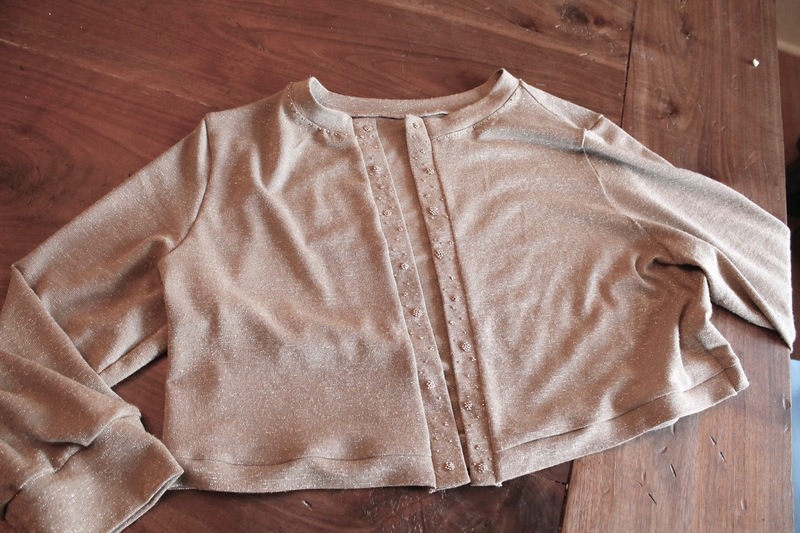 I sewed a thinner bottom band and left off the buttons. When it was done, I found that the sparkle wasn't reading as much as I thought it would be, so I spent a few evenings embroidering beads on it. It was a very satisfying project. 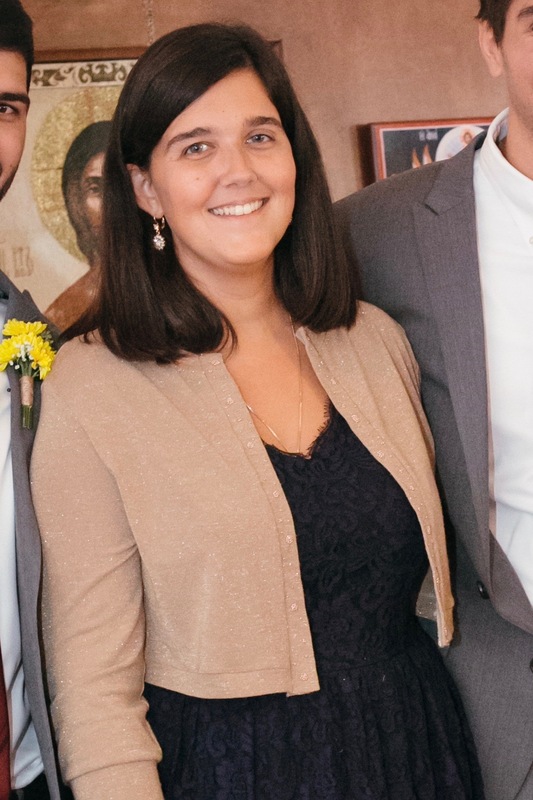 I was so busy during the wedding that I didn't have time to do any proper blog modeling, but here are the two photos I could find. 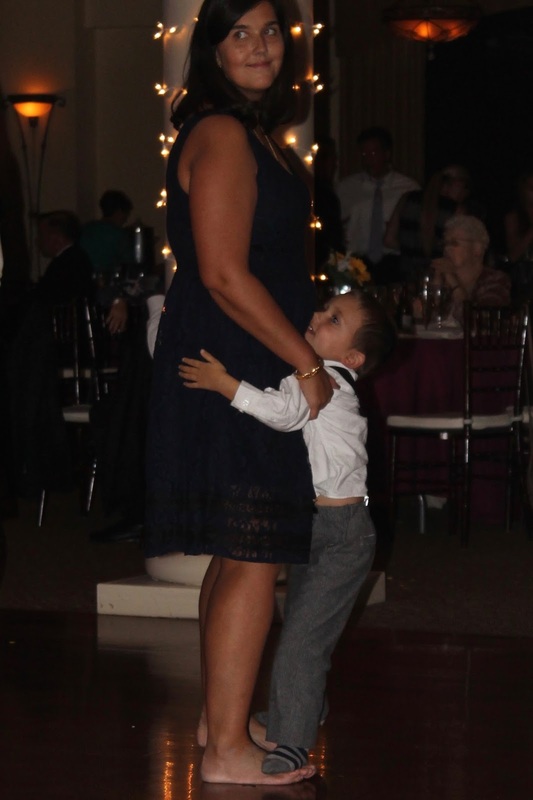 I know I've already posted about how much fun the wedding was, but it's good for morale to keep reminding myself of it. Because two days later, my husband had open-heart surgery for a problem that we thought wouldn't need addressing until his 50s. Then not two weeks later, we found ourselves back in the ER and were admitted for another surgery to fix complications arising from the first. We spent a lot of time in the hospital in November, and the few weeks since at multiple doctors' appointments each week. He is at home recovering now, but I have to say I wouldn't be sorry to never enter a hospital again. That was the last thing I sewed for about six weeks. I'm finally back at the machine again and have finished a few things for me that I'm looking forward to sharing. We just need some sunshine so I can take photos. Our winter has been warm thus far (and I'm not complaining), but a little dreary too. Is it spring yet? 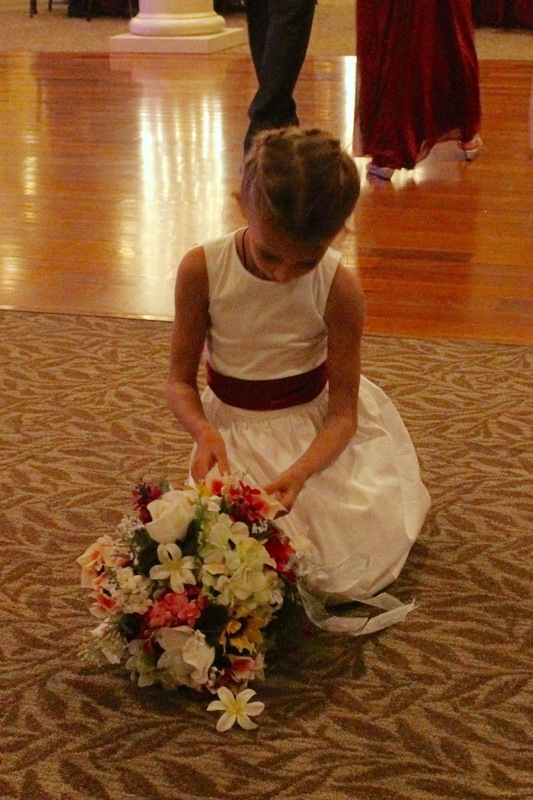 As promised, here's part 2 of the wedding sewing. 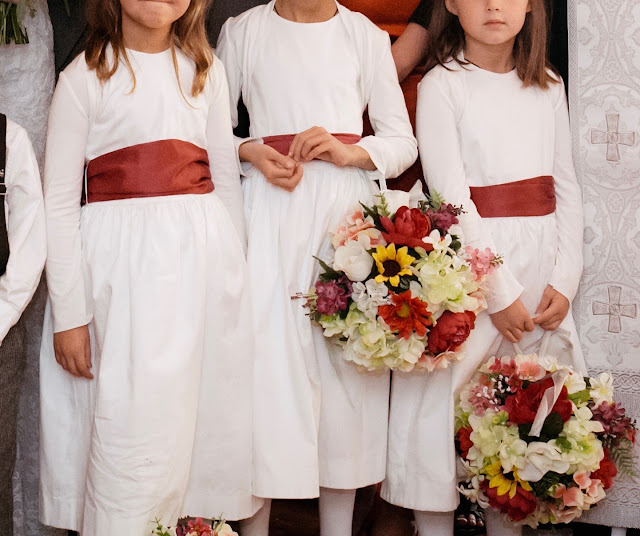 I sewed Oliver+S Fairy Tale Dresses for the three flower girls. I was originally going to use a posh cotton/poly satin from Mood Fabrics, but in the end I decided to save some money and bought this stretch cotton sateen from Joann's instead. I've used this fabric a few times before and I really like it. It has such a satisfying heft, a lovely sheen, and an almost spongy hand. It's a pleasure to sew and it works so nicely for a special occasion dress with a nice deep hand-stitched hem. I bought the Fairy Tale pattern ages ago, and when I sat down to cut my pattern pieces, I was dismayed to see that I only had the smaller size range. In the end, the size 4 ended up working just fine. I actually ended up taking Natasha's dress in significantly, nearly to the width of a 2 (I was overzealous and it ended up a smidge tight on her), but the 4 worked fine for the other two, who are both size 6 in RTW. 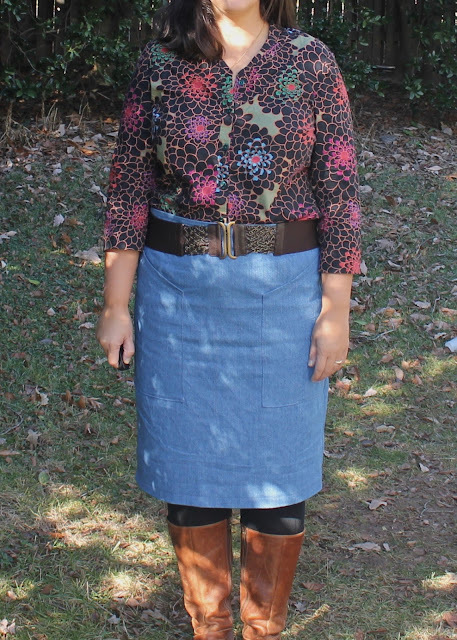 I added something like six inches of length to the skirt but I kept the bodice length as is. I like a slightly higher waist in little girls' dresses. The dresses are fully lined in white cotton voile per the pattern instructions. The only adjustment I made to the pattern was to the sash. The bride wanted it to wrap all the way around the waist. So I sewed up the dresses and made the sashes separately. The fabric is a synthetic satin from Mood, which was the only place I could find the right shade to match the bridesmaids' dresses (Sangria from David's Bridal). 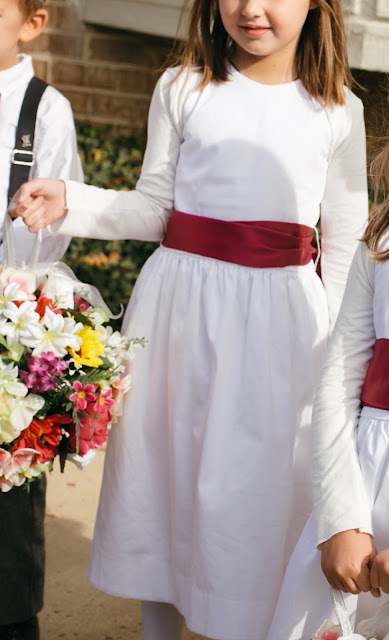 The sashes are all the same width as the pattern's ties, though for some reason it looks like Natasha's folded over while she was wearing it, making it seem thinner. I rushed the sashes at the side seams of the dress. Our sewing fairy godmother made the thread sash carriers for me and posted them to save me some time. As the dresses were sleeveless, the girls needed something to wear over them while outside. I intended to just buy RTW cardigans but couldn't find anything I liked. Then I remembered that I had a large cut of white cotton/lycra knit in my stash, and I ended up sewing three shrugs from stash fabric using this pattern that I've made before. The pattern only goes up to a size 4, but I figured it would be ok. I did lengthen two of the shrugs about an inch after I'd sewed the first one. 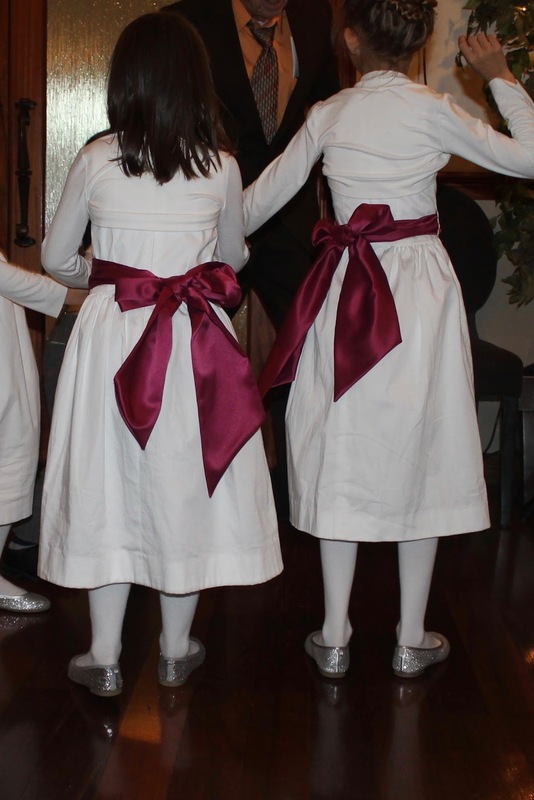 They worked perfectly (in the below photo, my niece on the right is wearing the unlengthened shrug, and N on the left, with the weirdly thinner-looking sash, is in the lengthened version). 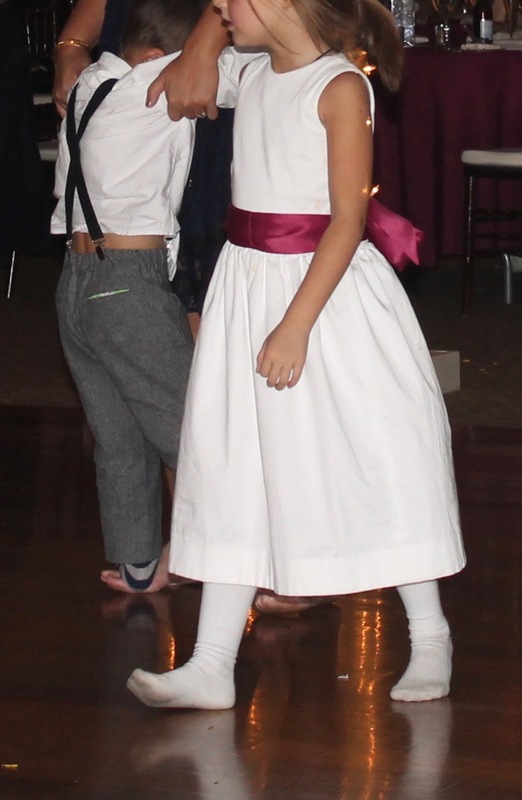 We all had a fantastic time at the wedding. My brother is the baby of the family and his wife came into his life literally a few weeks before our mother passed away. There were definitely tears thinking about her absence, but it was also a wonderful family time for all of us. 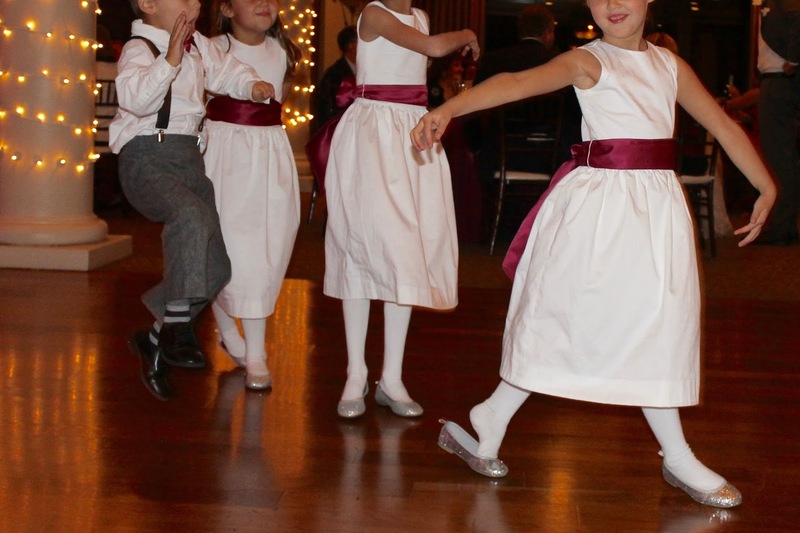 The kids, predictably, were the hits of the dance floor. After awhile the shoes came off. Then the tights followed suit. 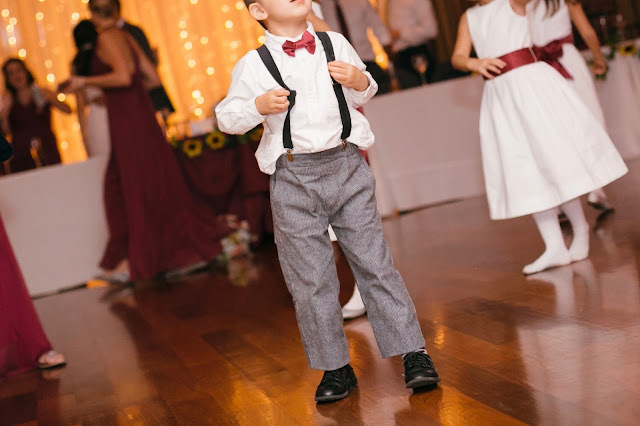 "Too sweaty," apparently, when you're bustin' a move. It has been so long since I've posted here, that I was afraid if I didn't put something up soon, I'd never post again. This fall and winter have been a little nuts. My brother got married at the beginning of November, and I spent the last two weeks before the wedding finishing up all the junior wedding party clothing, as well as making the cake. 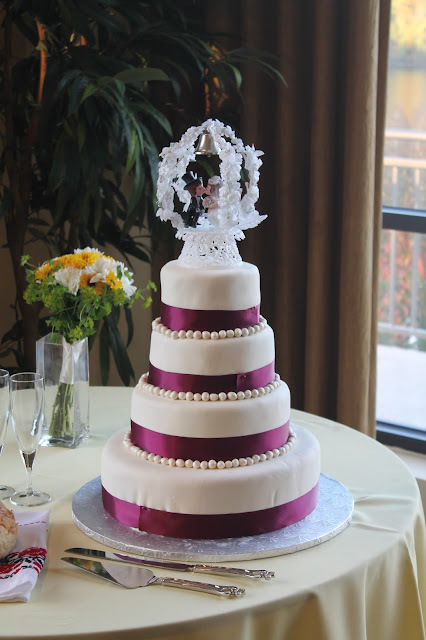 I've done tiered cakes before, but this was my first four-tier, and my first wedding cake. This sucker served 150 people. It was an almond cake with raspberry filling and almond buttercream frosting, covered in fondant. 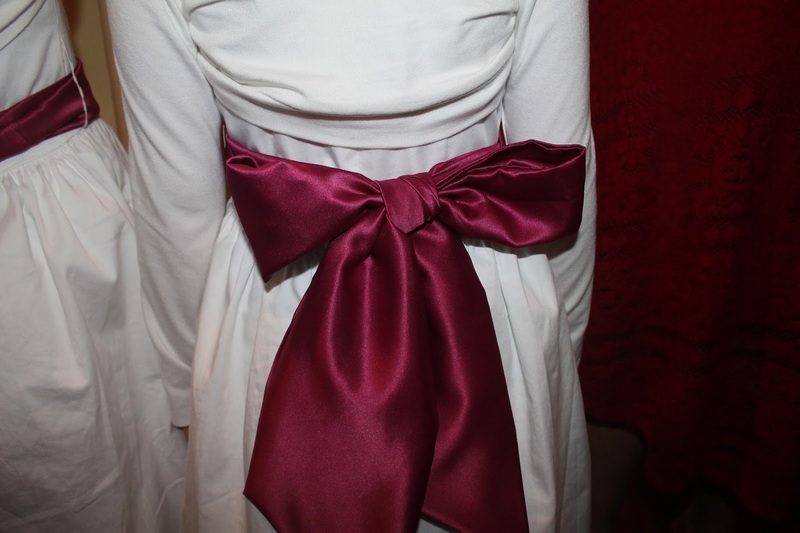 The ribbon was satin to match the bridesmaids' dresses, and the pearls (more than 300!) were hand rolled by me. This was such a huge job, but I was so proud of the finished product, and more importantly, the bride and groom really loved the cake. But that's not why you're here ... so on with the sewing. Today I'm going to post the boys' outfits, and hopefully I'll get the details up about the girls' later this week. 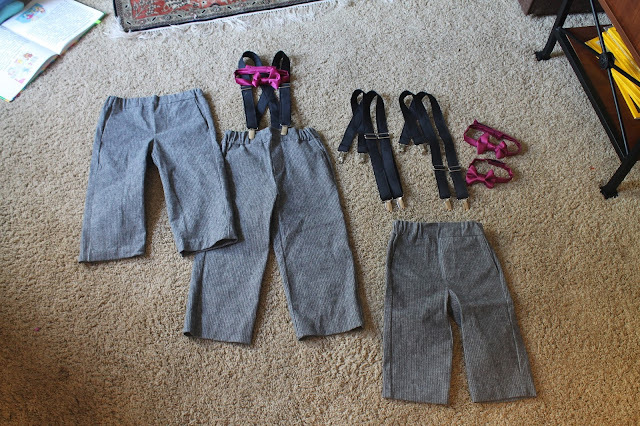 I sewed three pairs of pinstriped gray brushed twill Oliver+S Art Museum trousers, three satin bow ties and three pairs of black suspenders. I can nearly sew these pants in my sleep now, I've made so many of them. 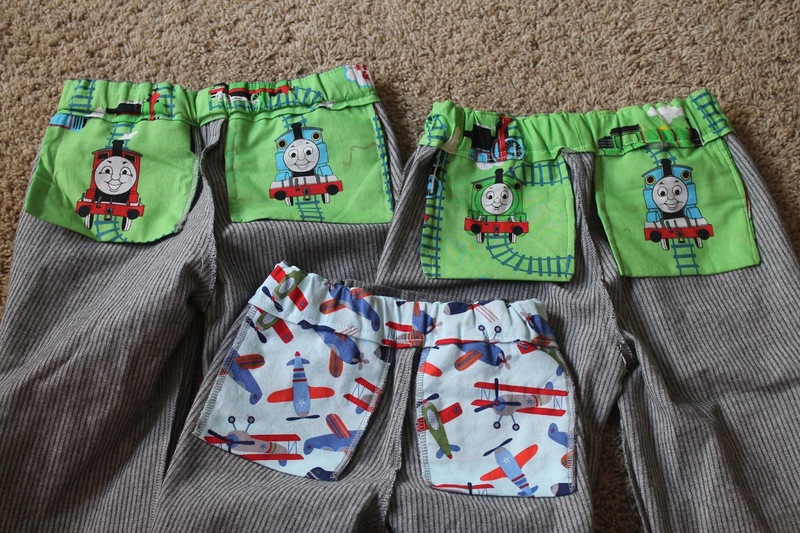 I bought the fabric from Cali Fabrics - it's a lovely sturdy fabric with a soft brushed texture; really perfect for little boys' winter pants. I WAY overbought, and have enough left to make myself a skirt and then some. 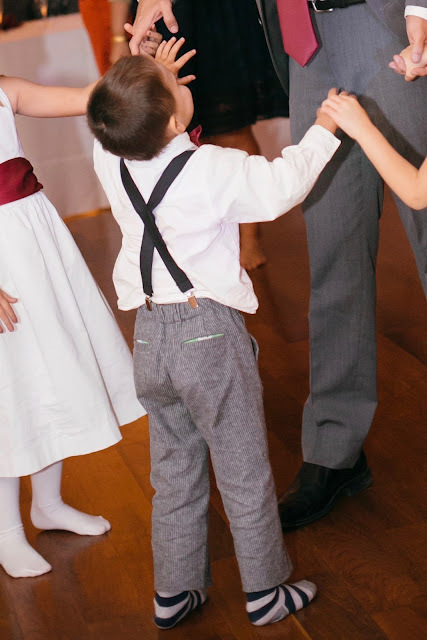 The bow tie tutorial, which I've used before, came from Make It Love It, and I used this suspender tutorial. Though for the money I spent on the necessary hardware, I could have purchased ready-made suspenders from Amazon and saved myself a couple of hours. 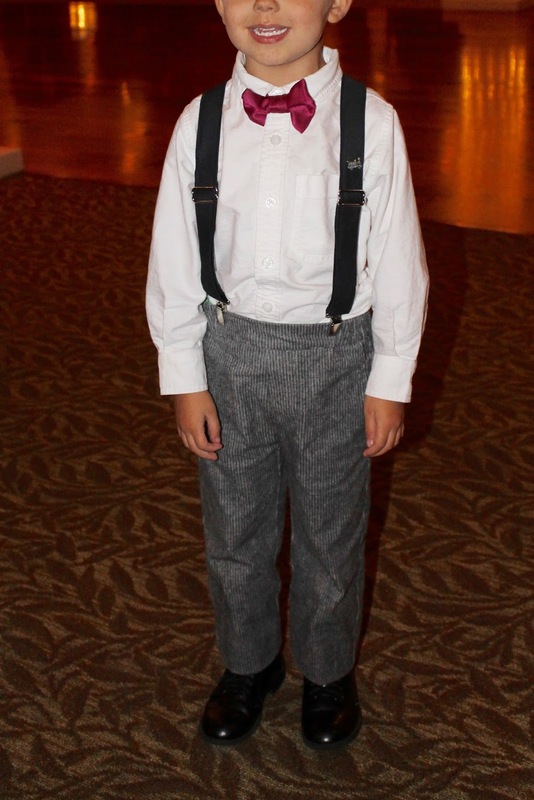 For black suspenders, it was not worth the effort. 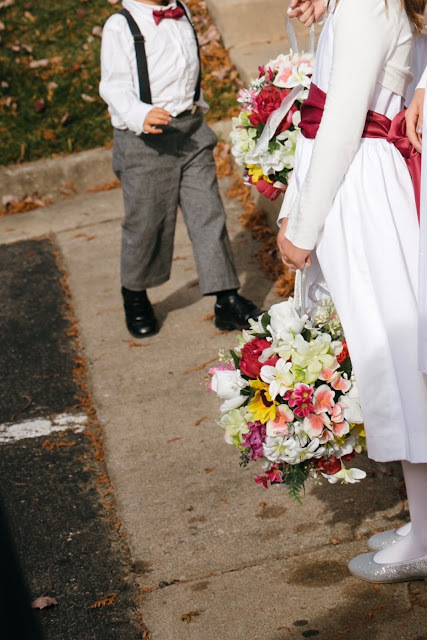 I was so busy during the wedding that I was not able to take any photos, and there weren't any good ones of just the three boys. G was the only one of the boys who made it to the reception, and he was a dancing fool. He even kicked off his shoes midway through the evening. Though by the end he was just plastered onto me and refused to let me out of arms' reach. 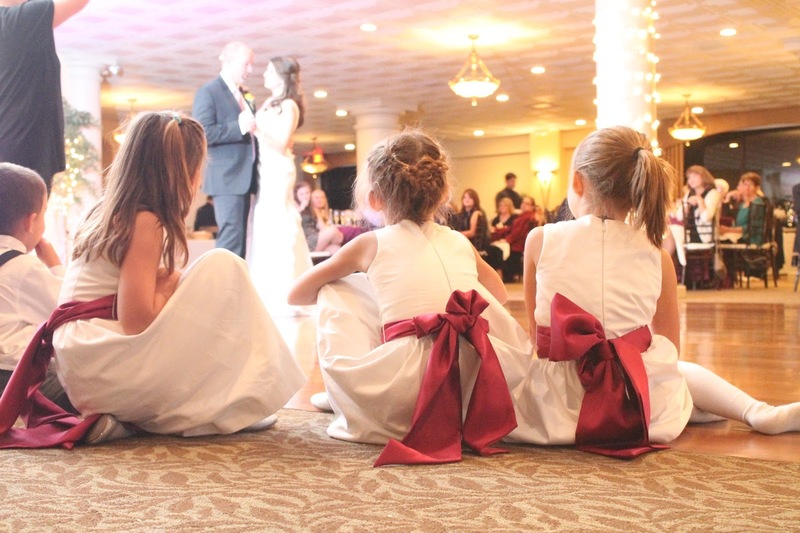 See you back here soon with photos and details of the girls' dresses!